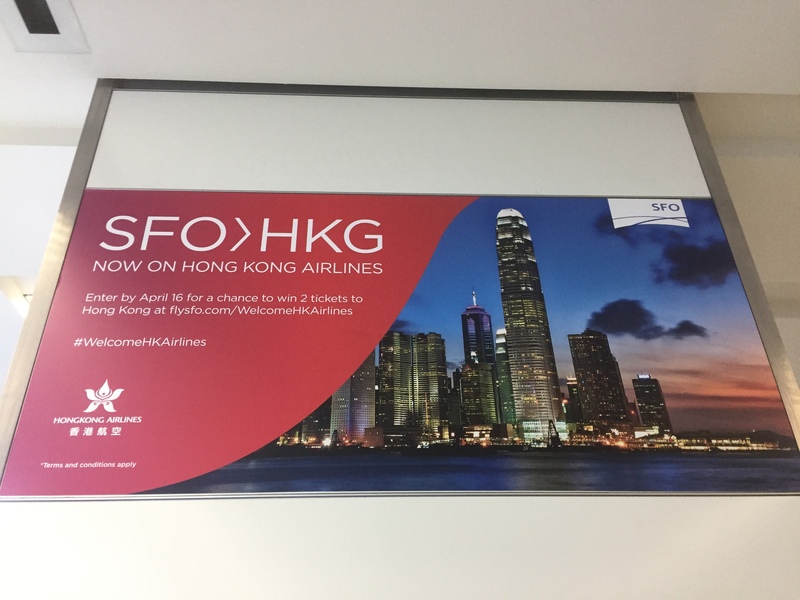 What comes to mind when you think of Hong Kong? 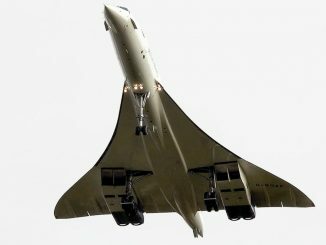 Maybe the action-packed movies of Jackie Chan or possibly its hearty dim sum and tightly packed skyscrapers. 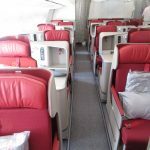 No matter your familiarity with Hong Kong, you can now experience the very best of Hong Kong onboard the airplane when flying Hong Kong Airlines, which now flies non-stop from Los Angeles, Vancouver, and most recently, San Francisco. 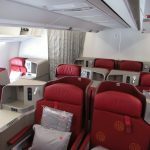 On March 25, 2018, Hong Kong Airlines introduced a new 4x weekly service from Hong Kong to San Francisco using their brand-new Airbus A350-900. 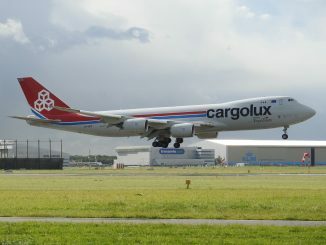 Flight HX061 takes off from San Francisco at 12:30 p.m. and arrives at 5:35 p.m. the following day. The return, flight HX062, takes off in Hong Kong at 1:10 p.m. and arrives in San Francisco at 10:45 a.m.
To make the new SFO service even more exciting, Hong Kong Airlines revealed days before the flight’s departure that it has partnered with San Francisco-based celebrity chef, Chris Cosentino, to bring some of the dishes from his famed South of Market (SoMa) restaurant, Cockscomb, to business class flyers flying from San Francisco. 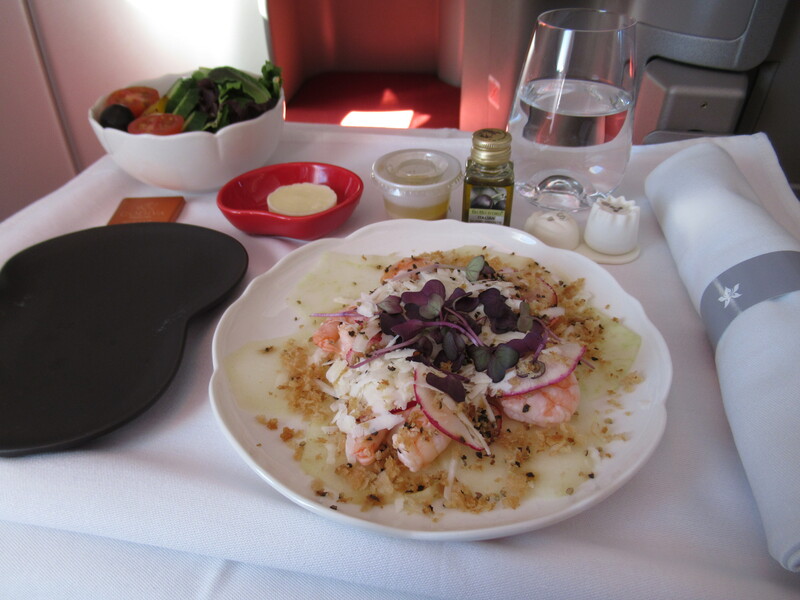 Cosentino’s dishes will also be added to flights from Los Angeles later this year. 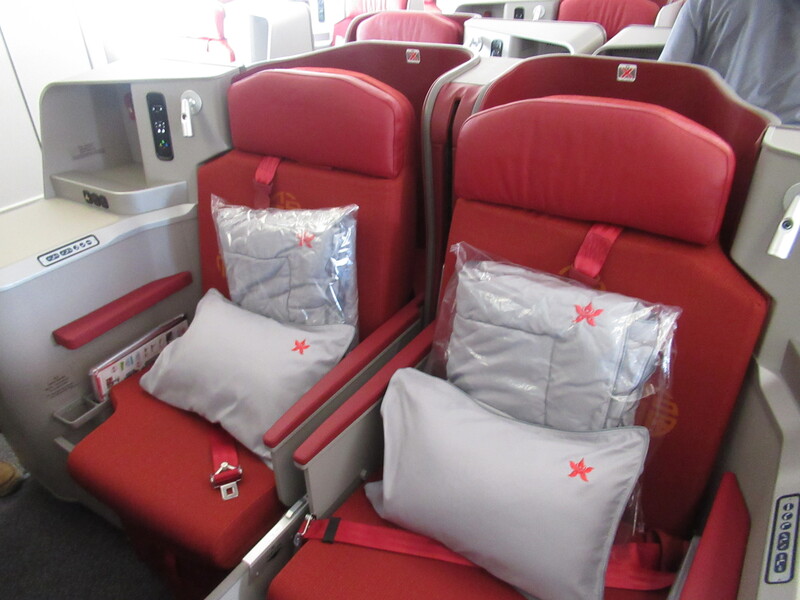 San Francisco is Hong Kong Airlines’ second destination in the United States and its third North American destination. 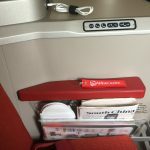 Hong Kong Airlines only recently operated its first flight to North America in June 2017 starting with Vancouver. 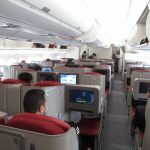 Daily service to Los Angeles was added that same year in addition, and the airline already operates to nearly 40 destinations across Asia and North America. 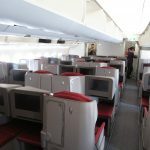 The San Francisco service will be expanded to daily by August 2018 once more A350s are delivered from Airbus, and New York service will be added before the end of this year. 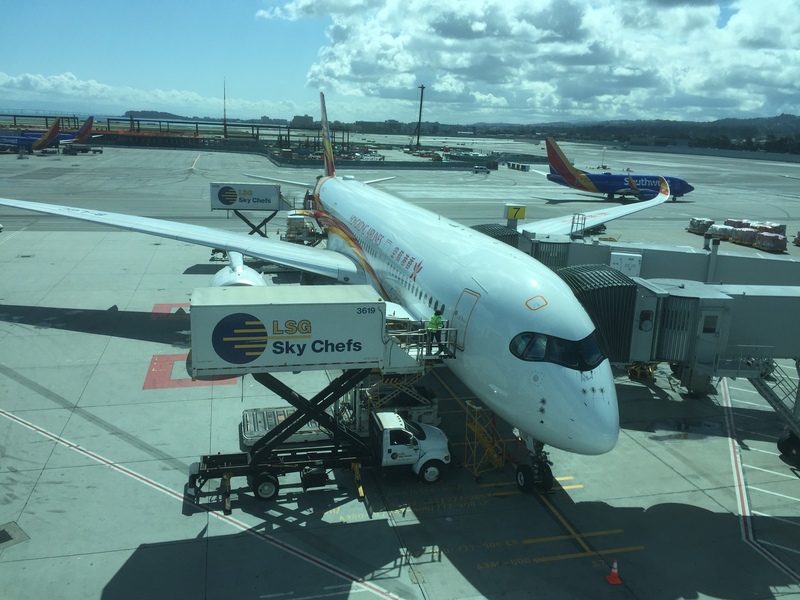 To celebrate the official launch of its new A350 nonstop, Hong Kong Airlines threw a big party at the flight’s boarding gate in SFO’s International Terminal A. 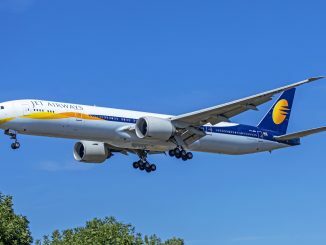 The celebration event took place prior to the inaugural flight’s departure to San Francisco. 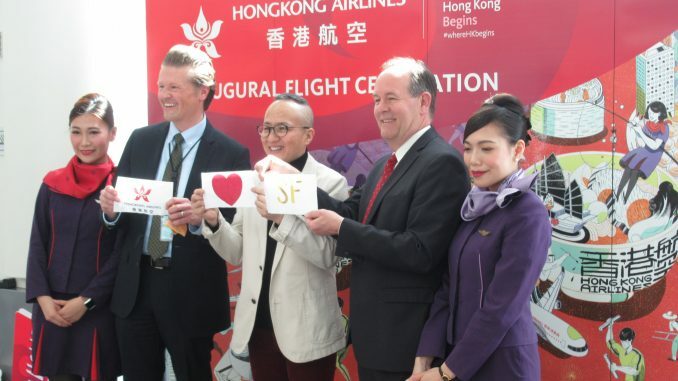 Several local dignitaries and Hong Kong Airlines corporate staff made their opening remarks including Doug Yakel, Public Information Officer at SFO, George Liu, Chief Marketing Officer for Hong Kong Airlines, Tracey Kwong, Corporate Communications Manager for Hong Kong Airlines, and Mark Chandler, Director of the San Francisco Mayor’s Office of International Trade and Commerce. 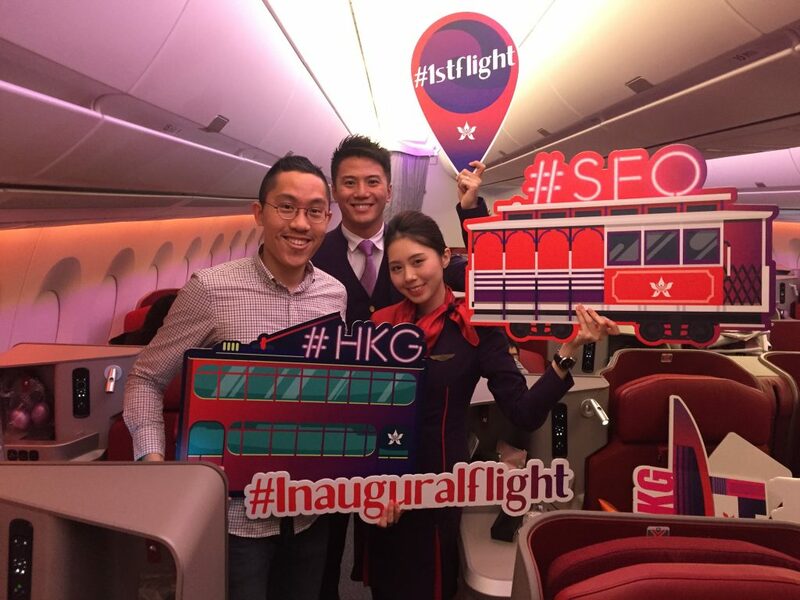 Hong Kong Airlines flight attendants also made their first public appearance in their bright purple uniforms at SFO. 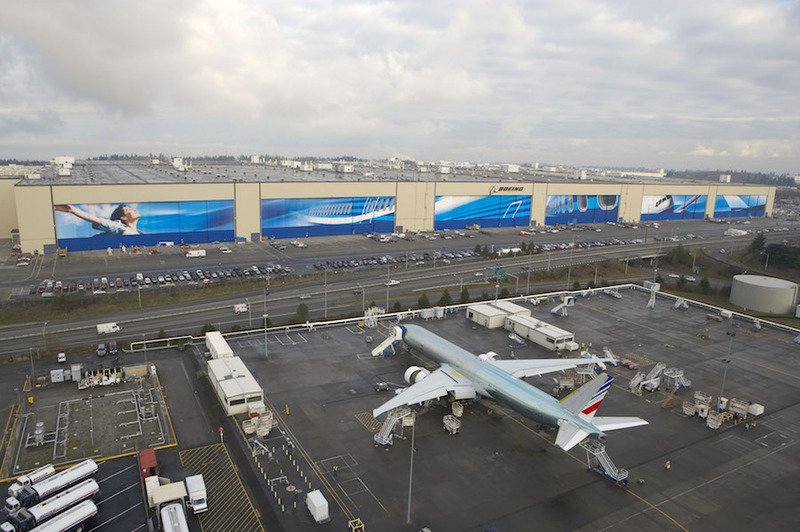 There were several photos ops with customized signs and visuals commemorating the first flight. 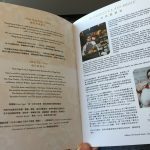 On display nearby was a table showcasing the dishes from Cockscomb that would be served onboard the flight. 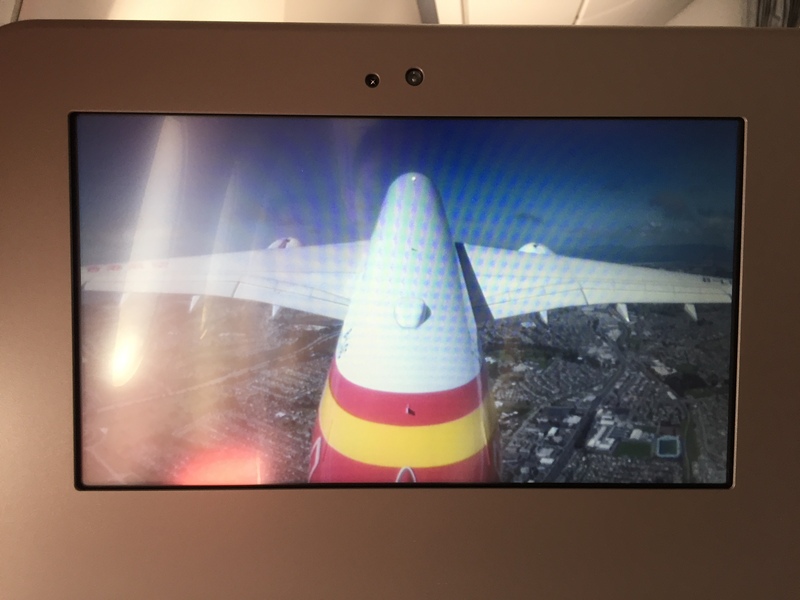 Speakers made their opening remarks on the first flight and congratulated Hong Kong Airlines on entering the San Francisco market. 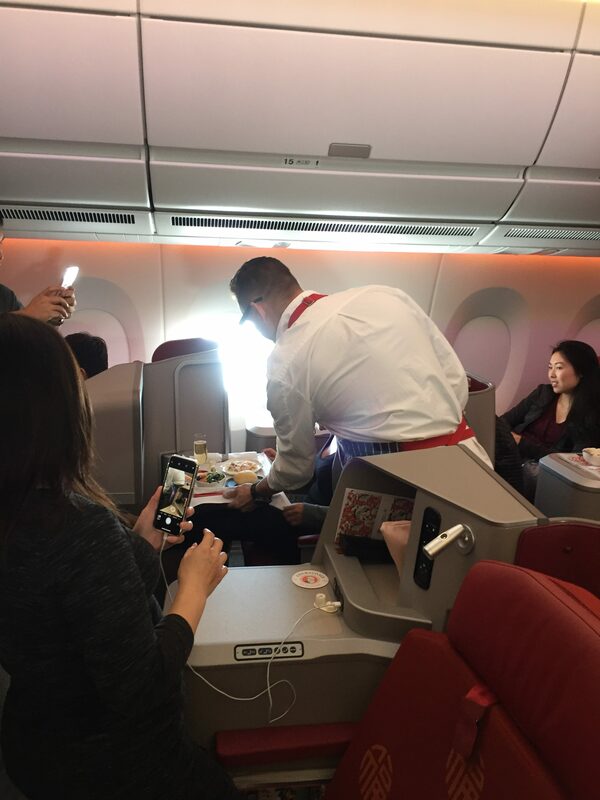 Once the opening remarks were complete and applause was finished, Liu introduced Chef Cosentino and announced the airline’s proud partnership with him for the flight to Hong Kong. 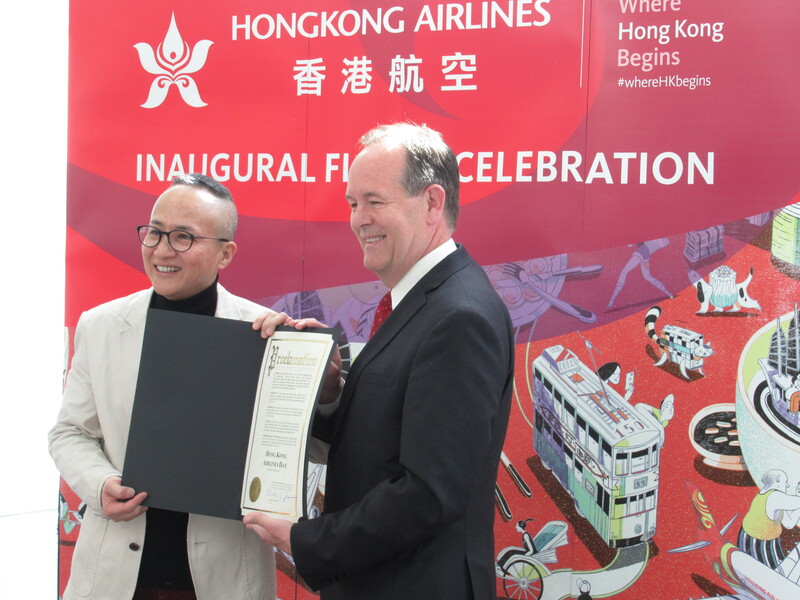 To commemorate the official launch of the new route, Chandler surprised Liu with a certificate issued from the San Francisco’s Mayor’s Office officially recognizing March 25 as Hong Kong Airlines Day in San Francisco. 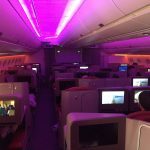 Minutes before boarding commenced, several members of the press and airport officials had a chance to step onboard to snap pictures of the new long-haul cabins on the Airbus A350. 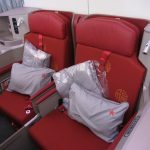 Hong Kong Airlines’ next-generation Airbus A350-900 features 33 lie-flat business class seats, 108 extra-legroom economy comfort seats, and 193 seats in economy class. 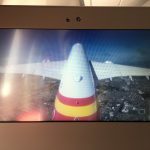 Hong Kong Airlines operates an all-Airbus fleet of single and dual-aisle jets, and it has already ordered 21 A350 aircraft as part of its expansion plan to North America and Europe, with currently four in operation. 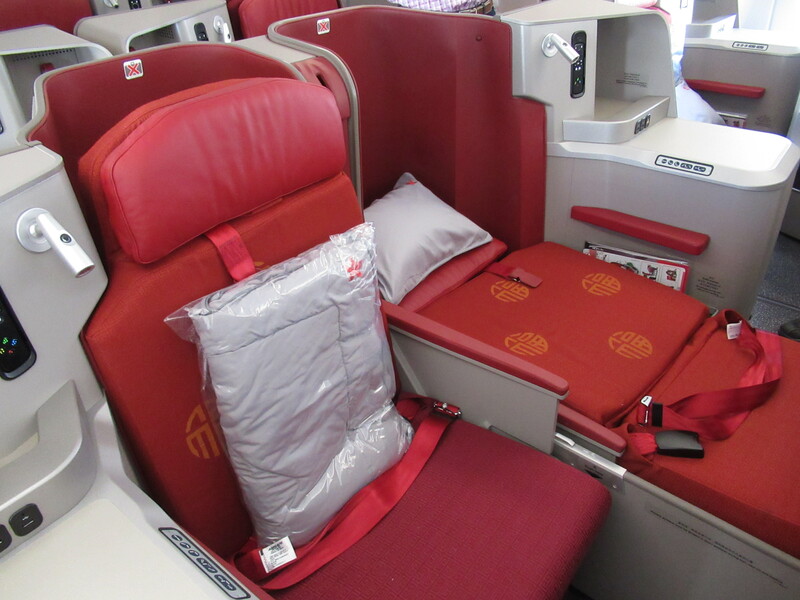 The official color of Hong Kong Airlines is obviously red as one can tell from entering the ocher red seats in the cabin. 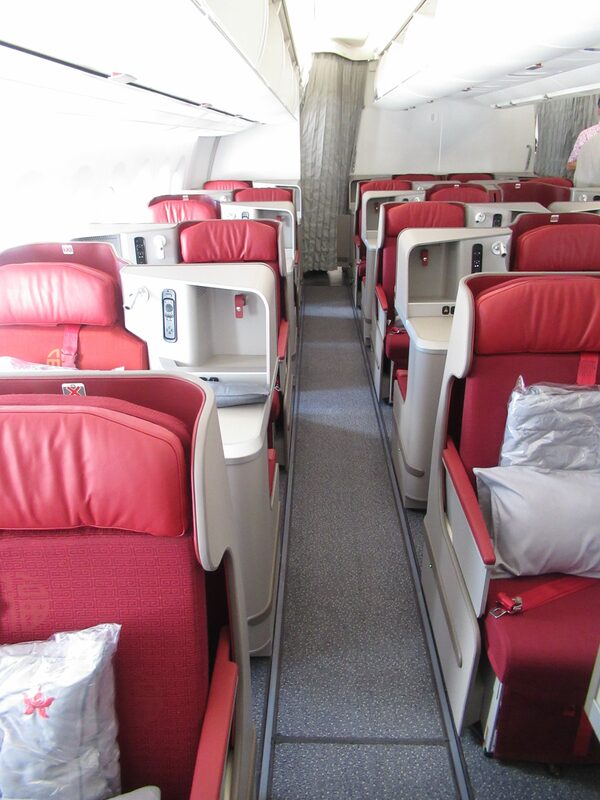 The A350 business class seat is an upgraded version of the older ones you find on Hong Kong Airlines’ A330s. 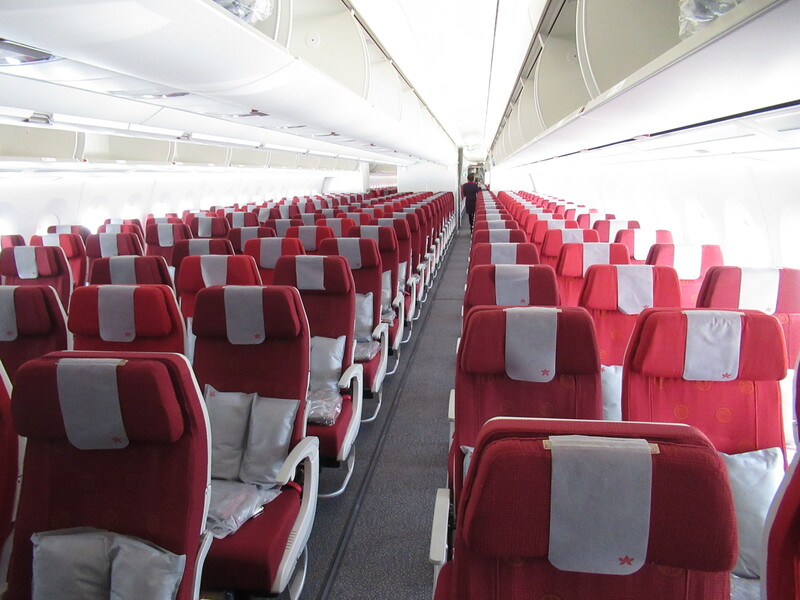 They are laid out in a 1-2-1 staggered configuration, with each seat having direct access to the aisle. 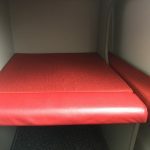 Every other row has a window seat that alternates between having the table adjacent to the window and beside the aisle. 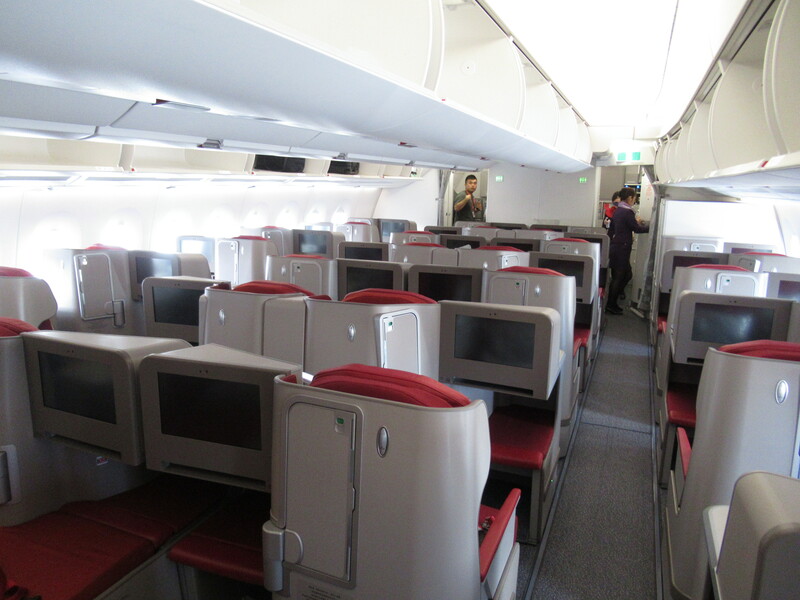 The center seats also alternate in the same fashion. 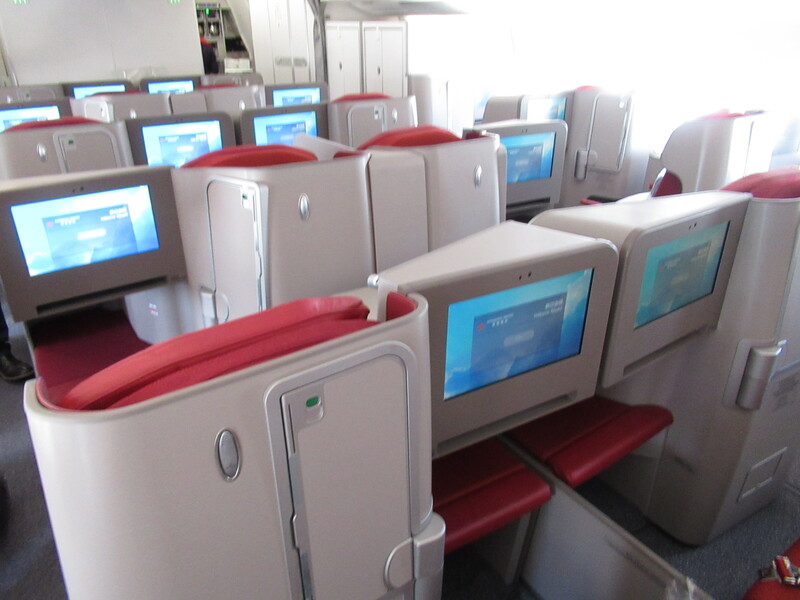 Each seat can be adjusted to several positions and lies completely flat at 180° for a good night’s sleep. 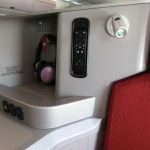 The new business class seat feature two USB charging slots, a power outlets for laptops if you need to work during the flight, an adjustable reading light with different brightness levels, a coat hook, and a convenient storage space for small personal items, and noise-canceling headphones. 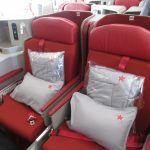 The flight attendants also distribute designer amenity kits, plush slippers, and soft duvet blankets with fluffy pillows. 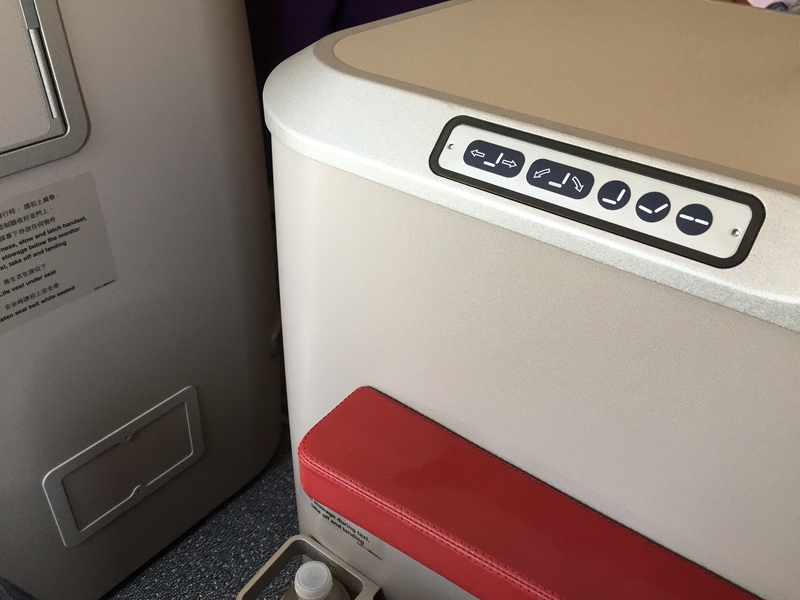 During boarding and arrival, ambient music is played to give one a sense of being at home. 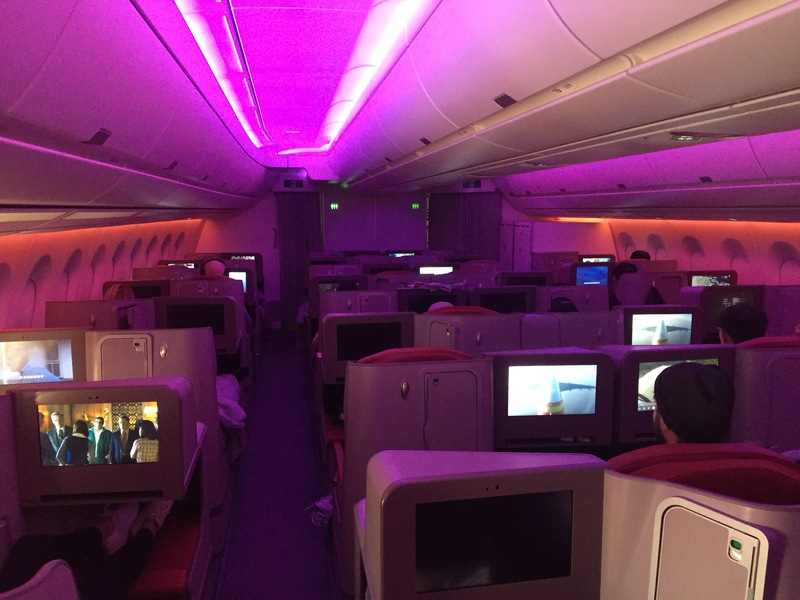 During the meal service, the cabin is lit with warm mood lighting. 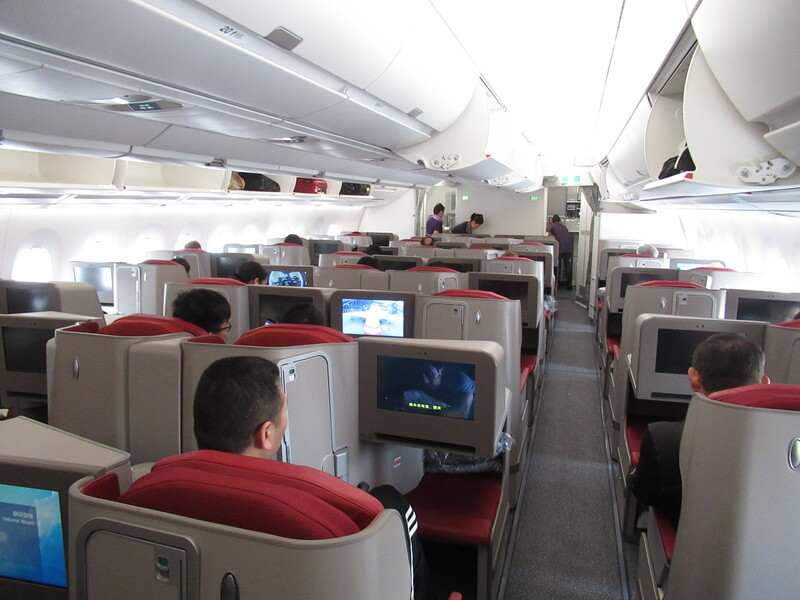 The inflight entertainment system has a great selection of new and classic western and Chinese movies. 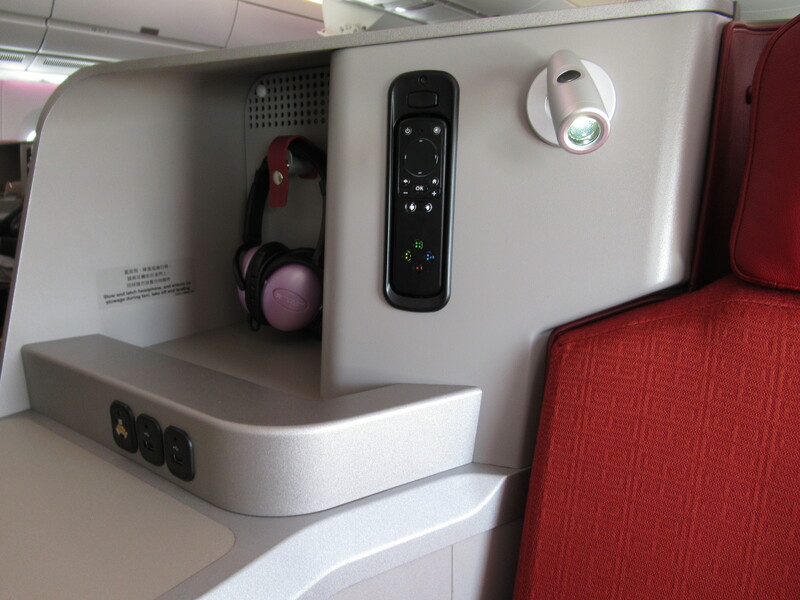 Although there is a remote control in the seat, I found it much easier to use the touchscreen. 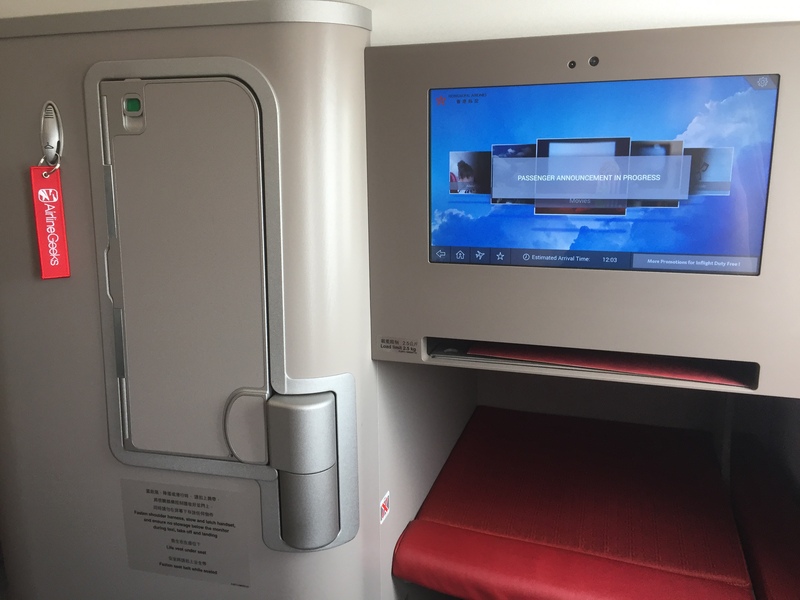 The touchscreen is really responsive and much easier for scrolling to find what you want. 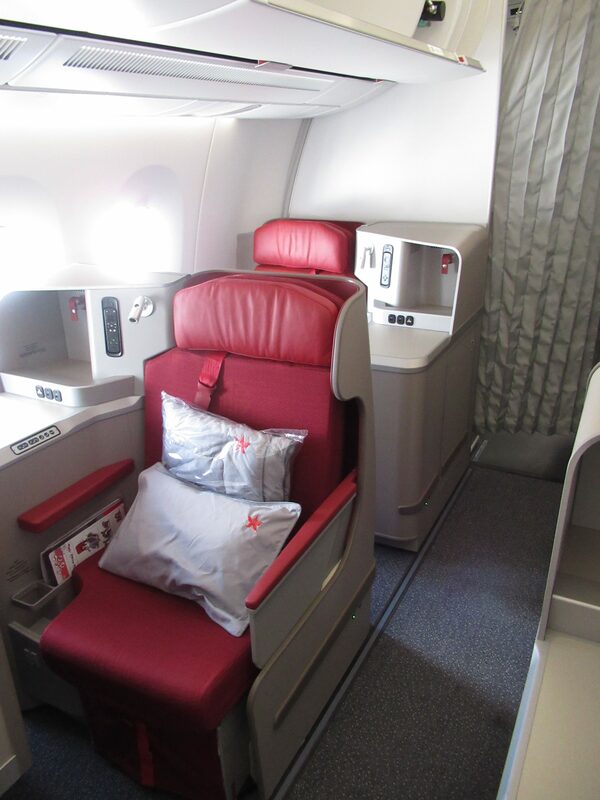 There is also Wi-Fi connectivity on the aircraft, and a 15-minute complimentary session is given to all passengers. 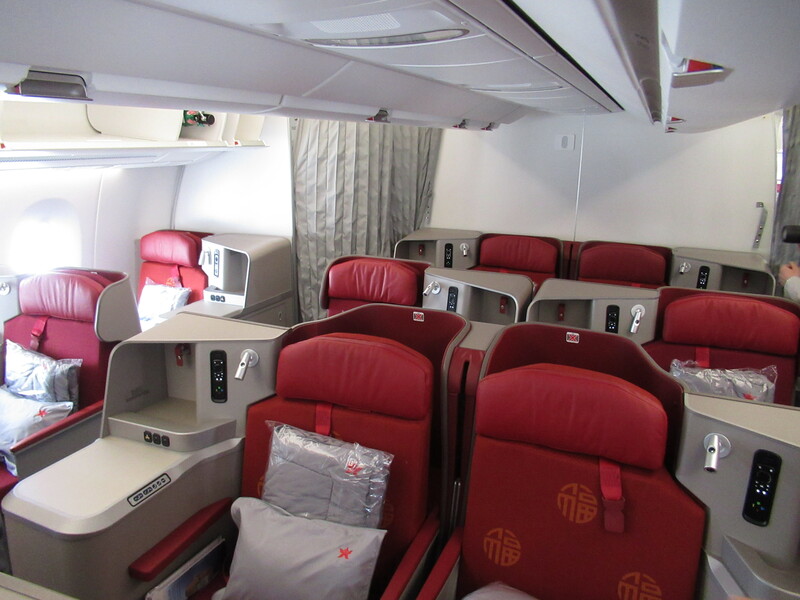 Hong Kong Airlines exclusively serves fine tea by Hong Kong’s Essense onboard. 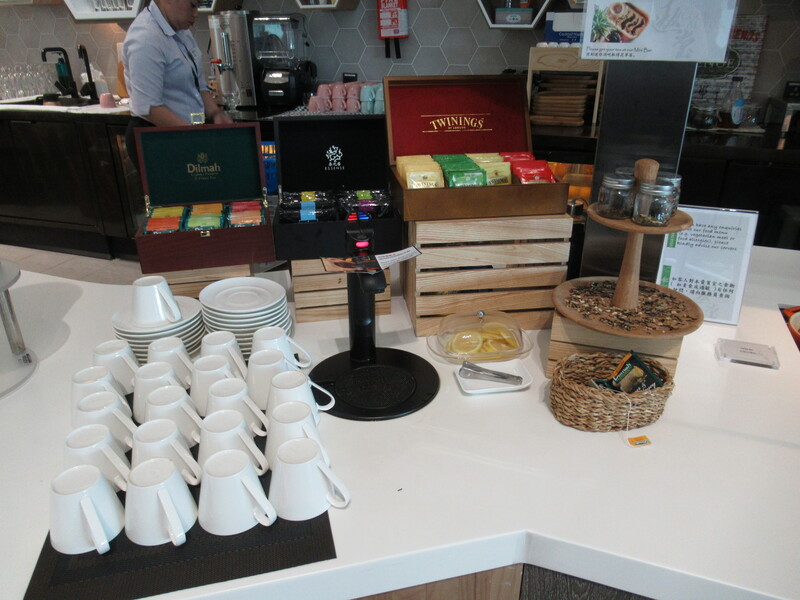 Essense sources its tea leaves and herbs from around the world. There are four different teas to choose from: Baiyaqlian Oolong Tea, Hubei Steamed Green Tea, Imperial Pu-Erh Tea, and Golden Tip Red. Each one has a different aroma and taste. 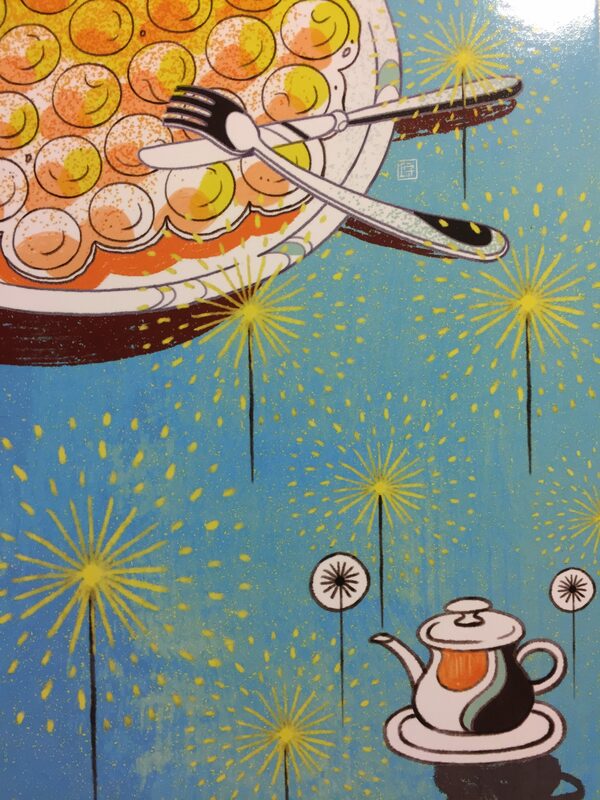 My favorite was the Imperial Pu-Erh, which has a rich, earthy and smoky flavor. There is nothing more delectable and Cantonese than Dim Sum. 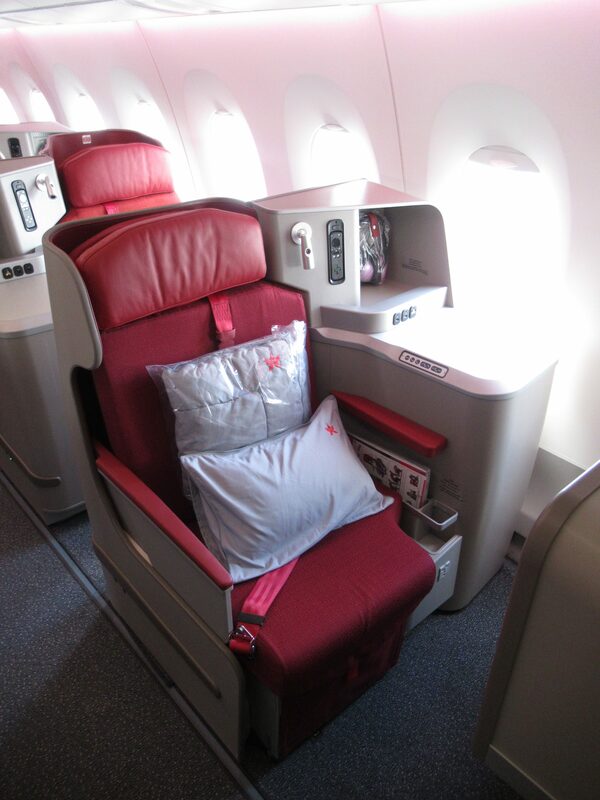 During the flight, business class passengers can request their own dim sum and tea to be delivered to their seat. 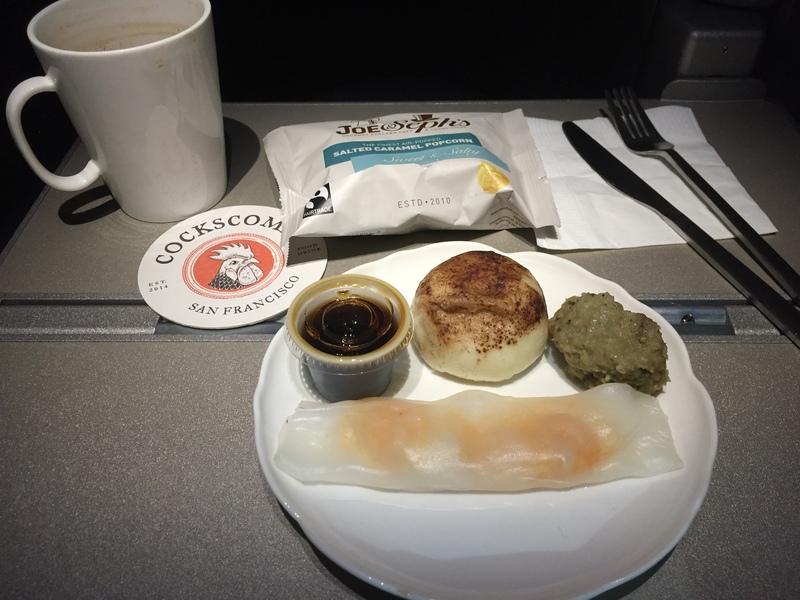 Although it’s served from the galley and not from a traditional dim sum cart, it tastes just as great. I was served chang fen (rice noodle roll with shrimp), bao, steamed meatball, and a piping hot cup of Baiyaqlian Oolong Tea, making it a great “yum cha” snack. 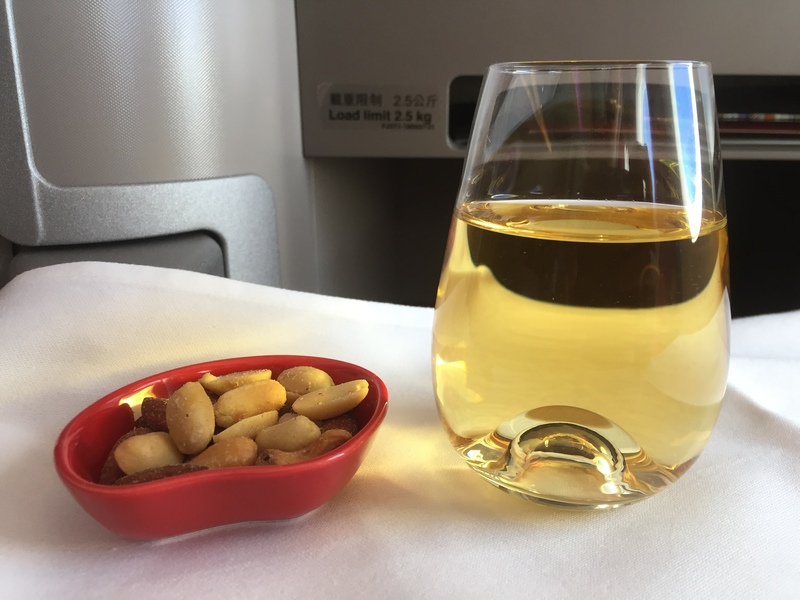 It’s very easy to immediately go for the glass of champagne or chardonnay when flying business class, but you definitely don’t want to leave Hong Kong Airlines without trying their specialty drinks which include Hong Kong-style milk tea, Yuan Yang (coffee with milk tea), and Lemon Tea. 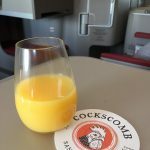 These refreshing drinks originated from England’s colonial rule over Hong Kong and are easily found in any local Hong Kong style diners (cha chaan teng). They can be requested hot or cold and are just as refreshing as they are in Hong Kong. If there is anything that can get you more excited about your trip to Hong Kong, it’s the artwork of Victo Ngai. 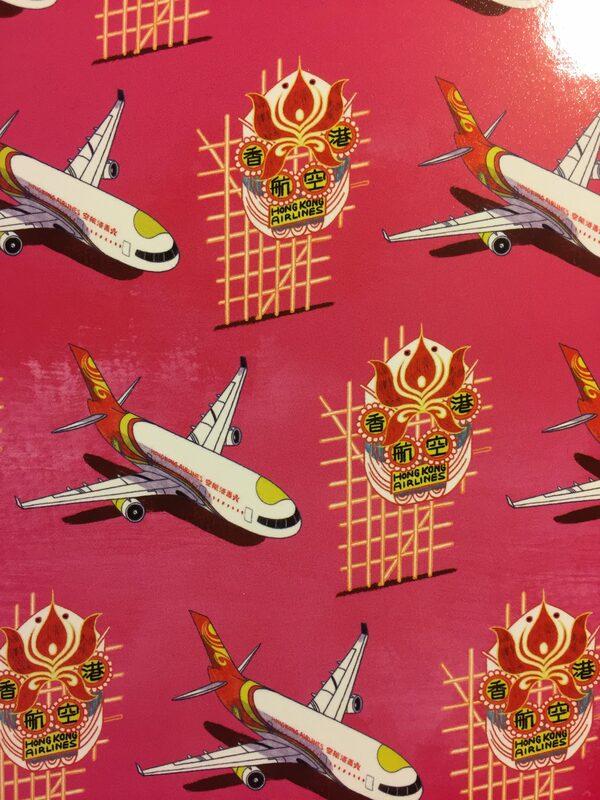 Victo Ngai is a Los Angeles artist originally from Hong Kong commissioned by Hong Kong Airlines to design several colorful and fun patterns for the airline. Her designs are featured on the airlines’ postcards, the business class menu, and several promotional pieces used by Hong Kong Airlines. 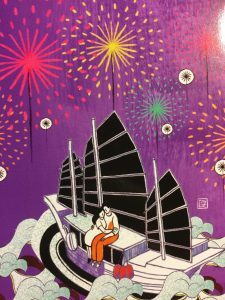 The imagery and cultural designs of Hong Kong foreshadow the excitement and energy that one is bound to experience in Asia’s grand melting pot, and it encourages passengers to create their own special memories in Hong Kong. 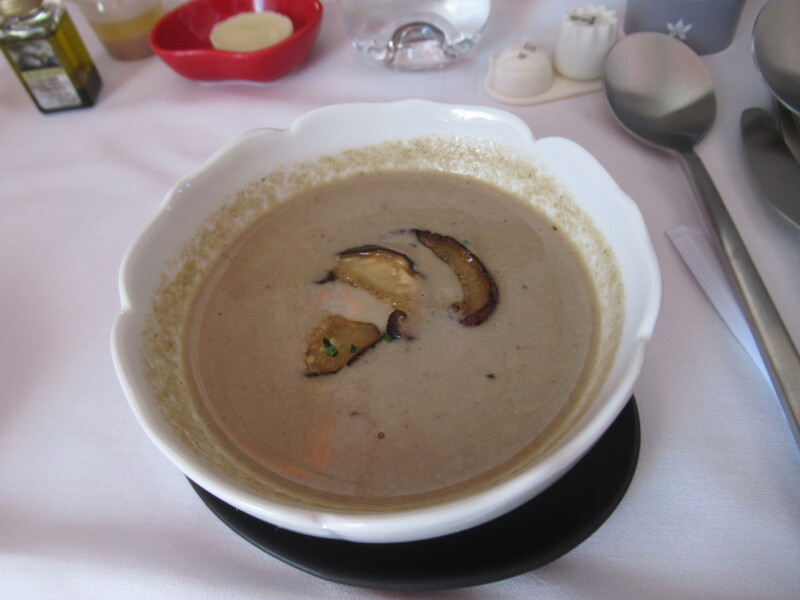 Chef Cosentino prepares a special meal from the galley. 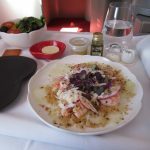 Chef Cosentino personally serves a business class passenger on the flight. 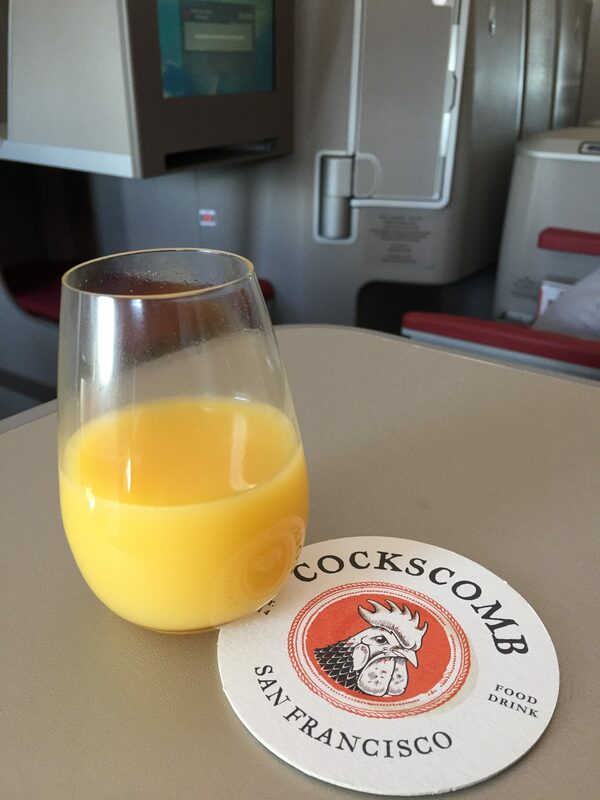 Cockscomb Restaurant is located in SF’s hip SoMA district. 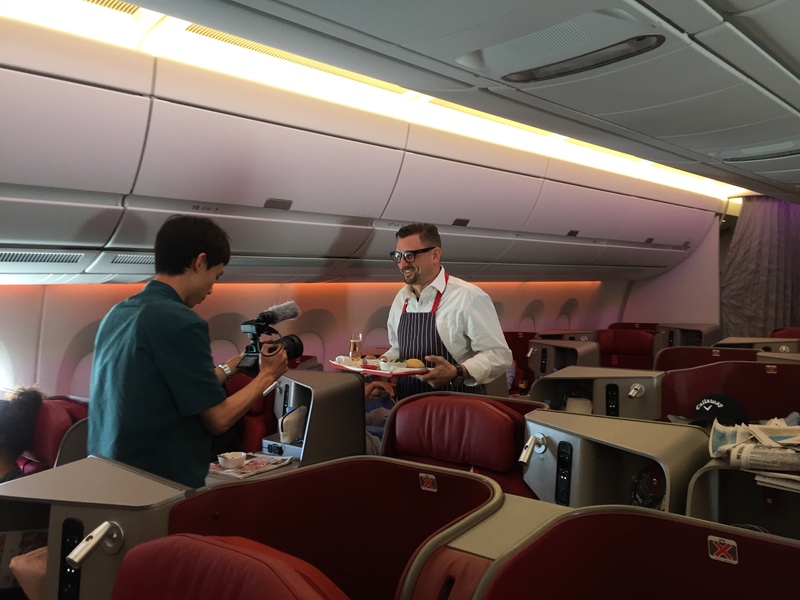 It was truly a surprise to everyone when Hong Kong Airlines revealed their collaboration with a famed Bay Area chef a few days before the inaugural flight. 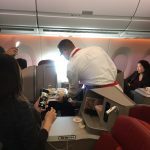 It became even more interesting when Liu revealed at the gate party that Chef Cosentino would actually be onboard the flight serving his famed restaurant dishes in person. 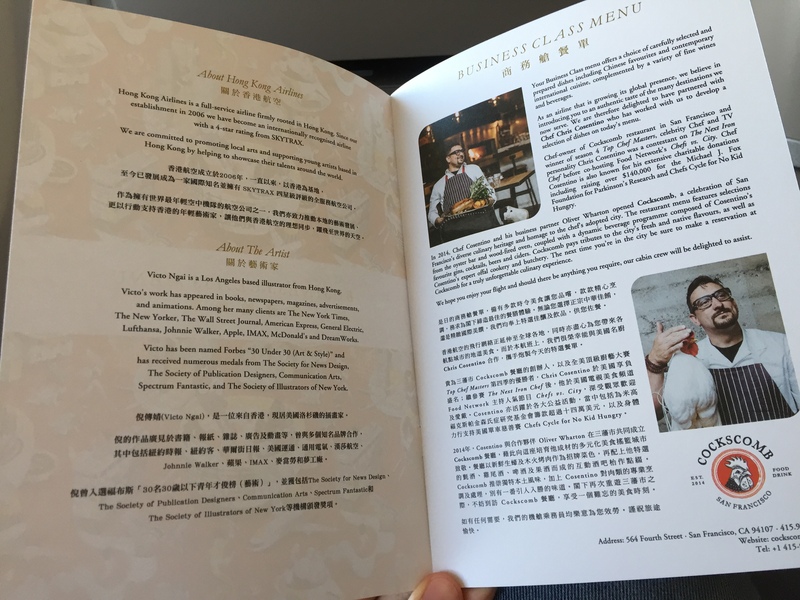 “For the fun part, nothing says it better than our partnership with Chef Cosentino,” Liu said. 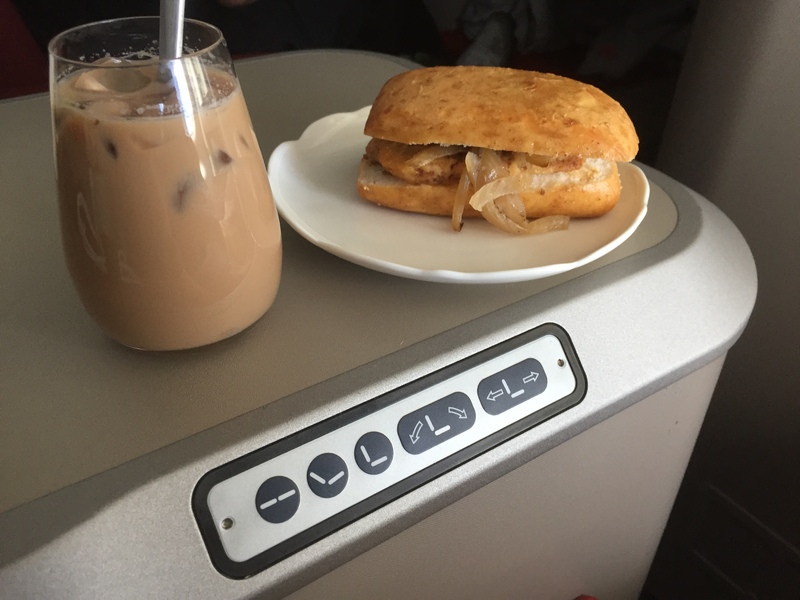 For our flight, lunch and a refreshment meal were provided along with mid-flight snacks. 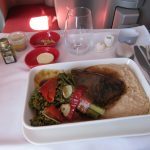 Business class passengers on the inaugural flight were served shrimp with sourdough crumbs and shaved parmesan, braised beef short rib in burgundy demi sauce with white bean puree and pickled pepper garlic broccolini, and for dessert, panna cotta and mixed berries with balsamic vinegar sauce. 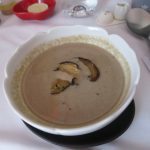 Chef Cosentino has designed a comprehensive menu of 12 different dishes consisting of a series of appetizers, main courses, and desserts that will be rotated regularly. 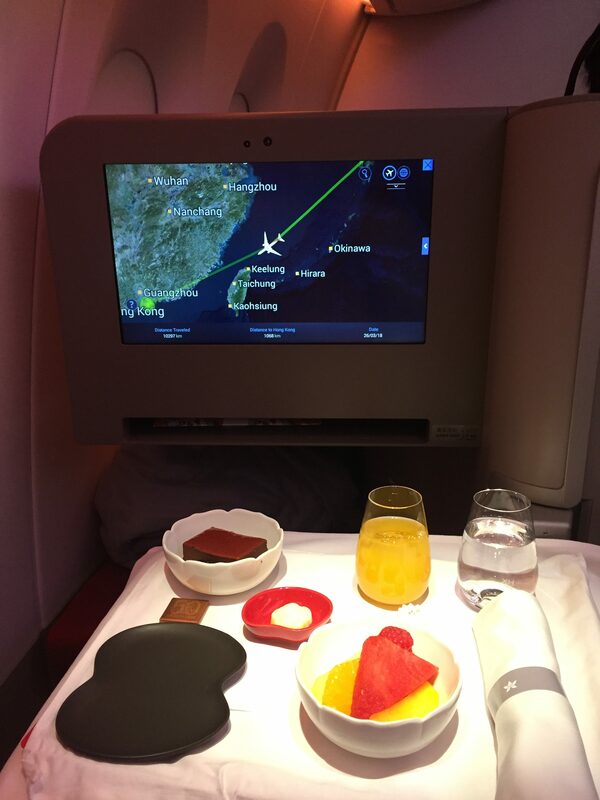 Working with LSG Sky Chefs, Cosentino spent several weeks replicating his favorites to be served in the air on the Hong Kong-bound flights. “Everything that will be done is exactly how we do it in our kitchens,” Cosentino mentioned. 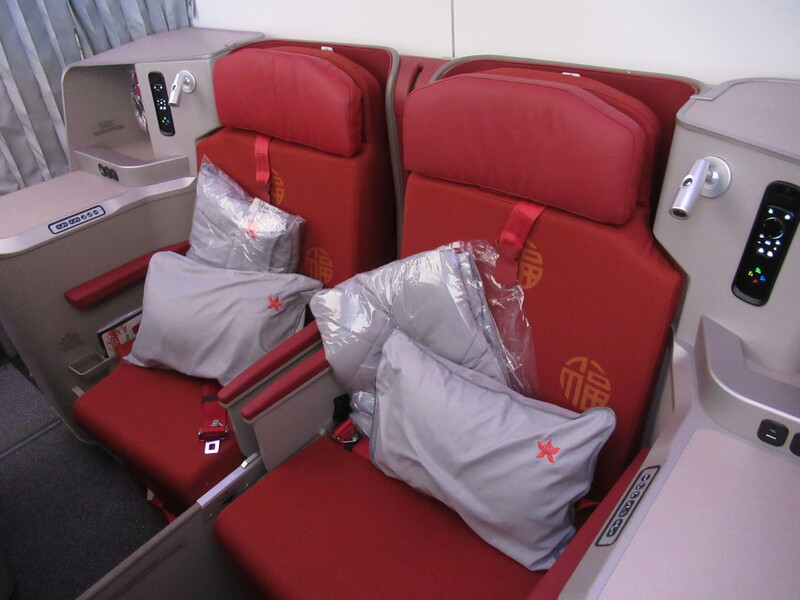 International kung-fu movie star Jackie Chan is the global brand ambassador for Hong Kong Airlines. 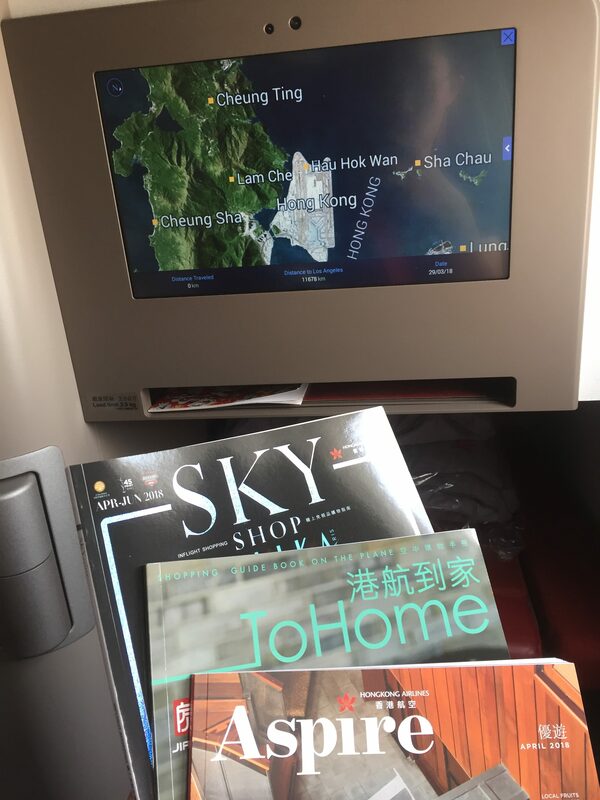 Chan has previously appeared on the inaugural flight to Vancouver and most recently in the commercial “Where Hong Kong Begins.” Hong Kong Airlines definitely did not forget to include some of his action-packed movies for the flight to Hong Kong. 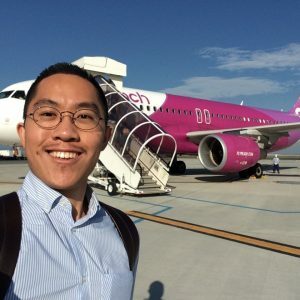 On this flight, I re-watched Rush Hour (both 1 and 2) and caught up on his latest flick, The Foreigner. 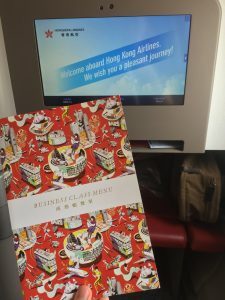 The business class amenity kits by Ricebowl Republic have a very simple black-and-white canvas design and highlight various symbols of Hong Kong such as the skyscrapers of Central and the Star Ferry on Victoria Harbour. 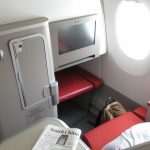 It includes an eye mask, ear plugs, lip balm and L’Occitane hand cream as well as a toothbrush and socks. 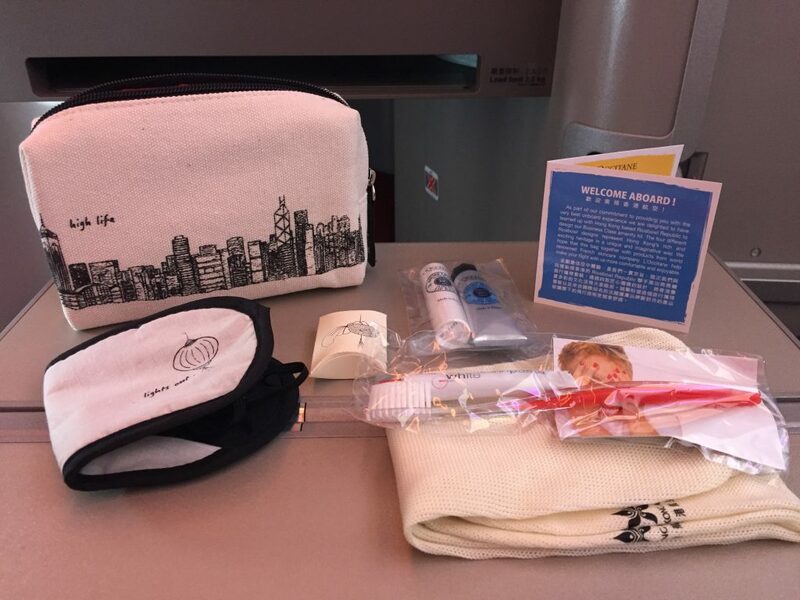 Every part of the amenity kit features a unique oriental image such as a Chinese porcelain, a lantern or a lucky pair of fish. 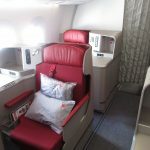 The crew on our flight were clearly proud to be onboard the inaugural trip and made sure all the passengers left satisfied with Hong Kong Airlines. 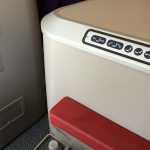 They were constantly walking around the cabin and speaking enthusiastically and fluently in Cantonese, Mandarin, and English with all the passengers. 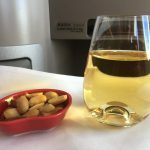 All the flight attendants were smiling and kind, and eager to fulfill requests and answer questions. 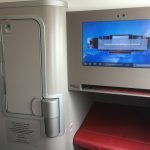 They also gave an announcement telling passengers that on their next flight, they have the option to order special gifts like birthday or anniversary cakes and bottles of champagne for other passengers. 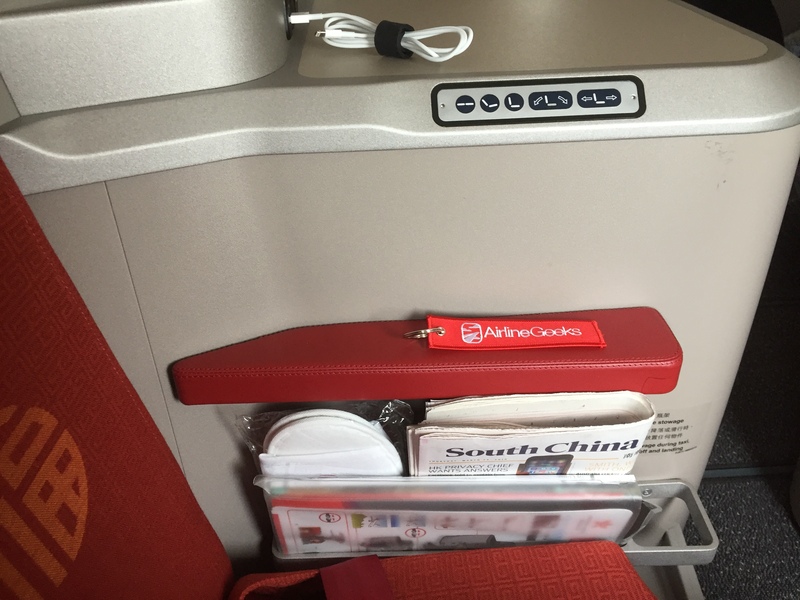 It’s part of Hong Kong Airlines “Sweeten You Up” service that can be pre-requested online. 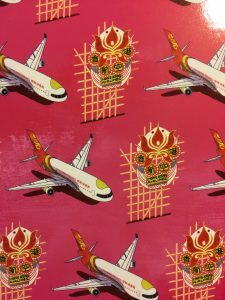 Hong Kong Airlines has partnered with an award-winning, local homeware design brand, JIA, to develop a new selection of exclusive business class tableware that showcases Hong Kong’s unique heritage and culture. 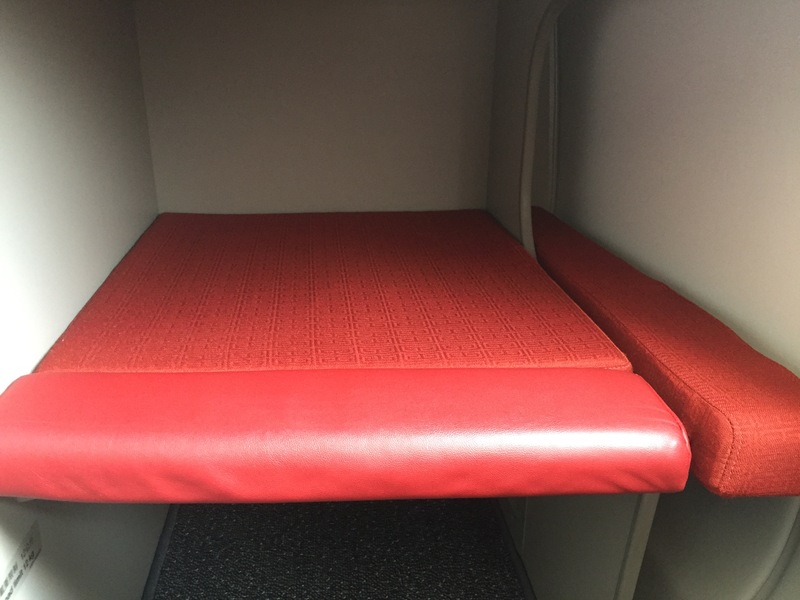 They have only been recently introduced on transpacific services back in December. The floral-shaped tableware is inspired by Hong Kong’s Bauhinia flower, and the salt and pepper shakers are shaped into dim sum pieces. 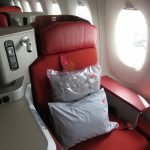 Hong Kong Airlines is a fairly young airline, but they have big ambitions to attract a large customer base and expand their presence in North America. 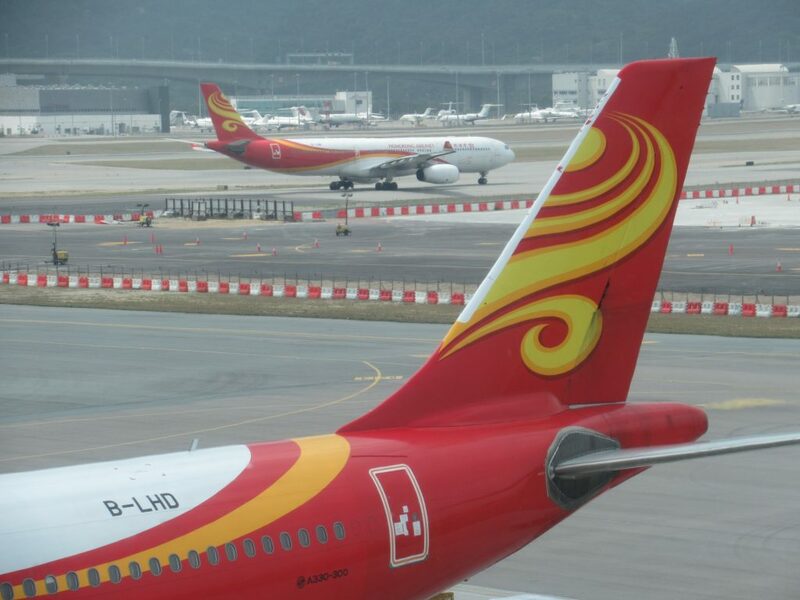 Hong Kong Airlines is part-owned by the giant Chinese conglomerate HNA Group, which has helped the airline grow quickly in the past few years, and now it’s competing with local top dog Cathay Pacific on transpacific routes to Los Angeles, Vancouver, San Francisco, and very soon London and New York. 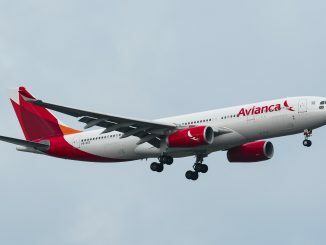 Furthermore, the airline has a large existing regional network to feed its new long-haul services. 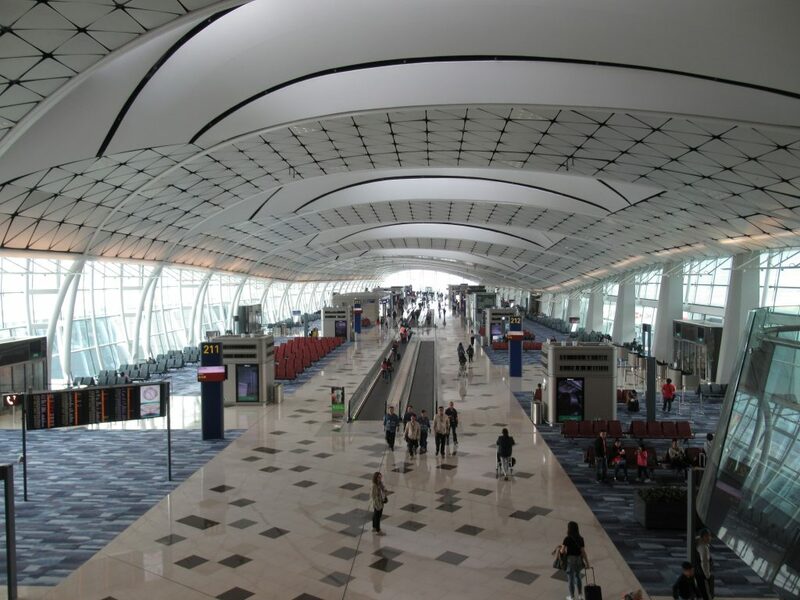 According to Liu, the airline will also be adding Manila as a new destination to its growing network, which will be a big benefit for those flying from Los Angeles and San Francisco. 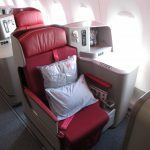 While Hong Kong Airlines isn’t part of one of the big global airline alliances, they do have very attractive fares – economy class seats start at around $537. 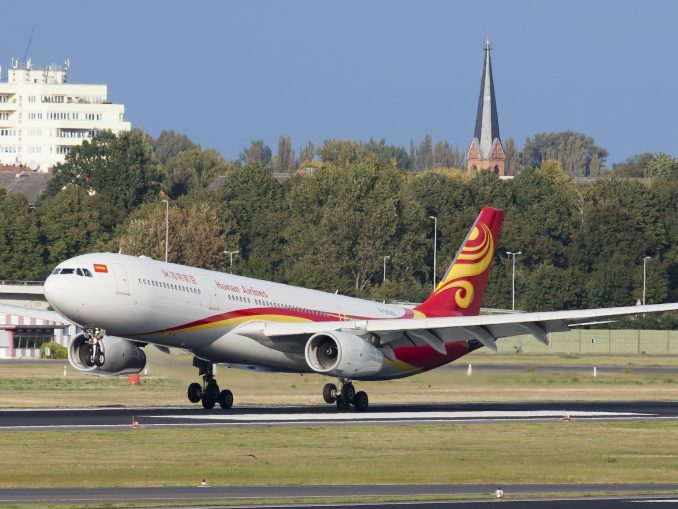 In addition, its Fortune Wings Club (FWC) loyalty program allows you to also earn miles on all HNA Group airlines including Hainan Airlines and Hong Kong Express. 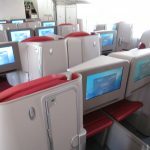 Through FWC’s new Accelerate Program, you can also convert the miles you fly on Hong Kong Airlines into points on Delta SkyMiles, American AAdvantage or Alaska Mileage Plan. 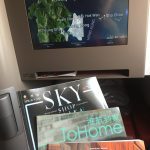 Members of those airlines holding elite status also get to enjoy priority check-in, free upgrade to Economy Comfort, priority baggage handling, and access to their club lounges in Hong Kong. 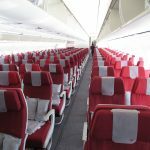 Although Cathay Pacific itself is also expanding its network despite major losses in the past year, Hong Kong Airlines is only choosing to serve four North American cities that have massive demand for travel to Asia. 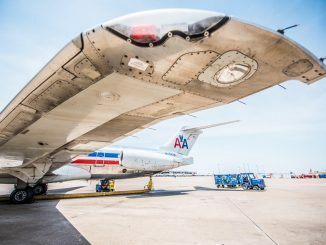 With their competitive prices on their North American flights, they definitely can compete with longtime carriers flying to North America. 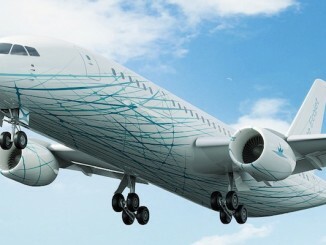 Rosavia’s Frigate Ecojet: Could It Be a Game-Changer?